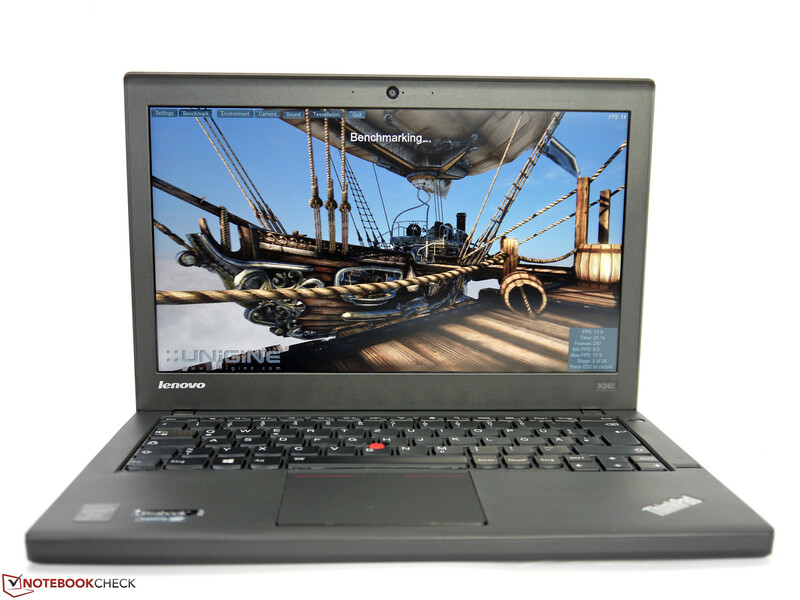 The Lenovo ThinkPad X240 is the direct successor to the ThinkPad X230, offeringa wealth of exciting novelties. 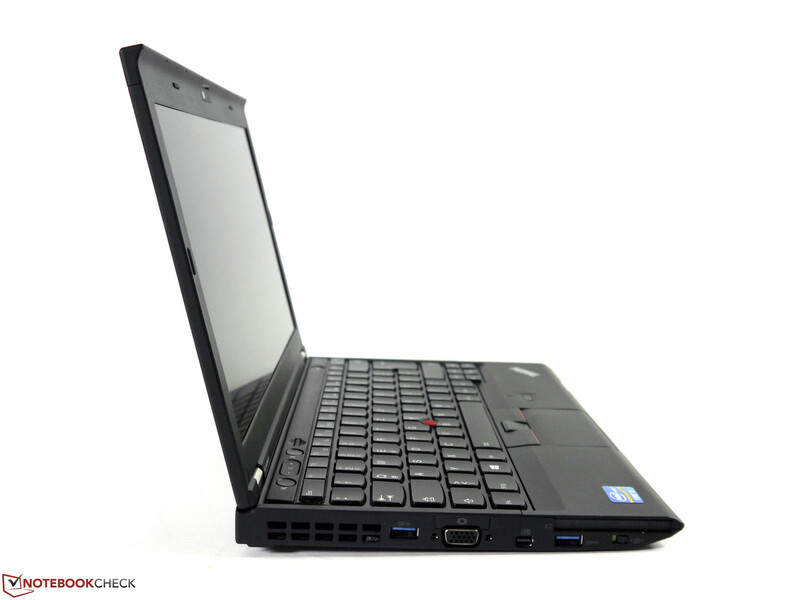 While the ThinkPad X230 looked pretty much the same as the ThinkPad X220, the ThinkPad X240 comes with a completely redesigned chassis - a move which we have already noted in case of the ThinkPad T440s and with several variants of the S series. Thanks to the highly efficient Intel Haswell CPU, affordable solid state drives and new battery designs, much slimmer cases are possible than before, leading to a welcome improvement in terms of mobility. Our test device can finally call itself an ultrabook, shipping with the prestigious moniker. Prices start at 850 euros for the variant with an Intel Core i3 CPU and a TN display (20AL0081GE), going up to almost 1900 euros for the variant with a touch display and an Intel Core i7 CPU (20AL0076GE). Our test device is called 20AL007NGE. It ships with an Intel Core i7-4600U-CPU, Intel HD Graphics 4400, 8 GB of RAM, a 256 GB SSD, WWAN and the HD IPS display without touch, costing a decidedly premium 1800 euros. 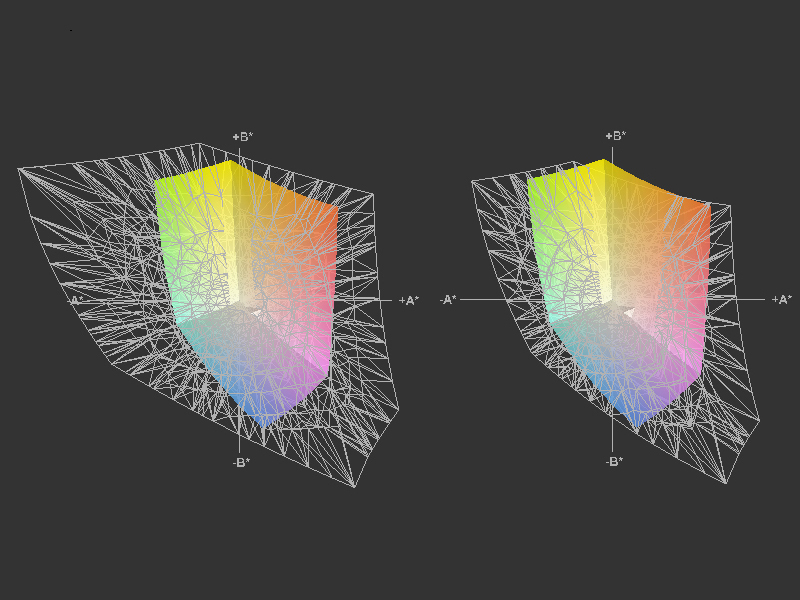 The most obvious innovation shows itself when taking a look at the dimensions. 6 millimeters less (in terms of height) when compared to the ThinkPad X230 (measured without the rubber feet) looks a lot slimmer. Instead of a wedge-like shape, an overall flat design language has been implemented, yielding a more streamlined and more modern look. 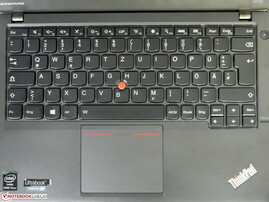 Still, the typical ThinkPad design has been retained, fostering Lenovo's still-excellent brand recognition. Even the clamshell design of the display lid is still there, at least to some degree. Our test device comes in at 1450 grams, weighing exactly 100 grams less than its predecessor. 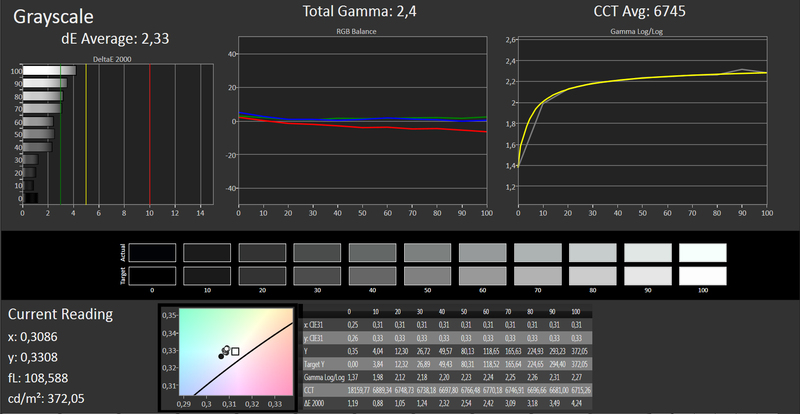 Then again, the battery capacity has been reduced from 62 Wh (X230i) to approximately 47 Wh, 15 Wh less. 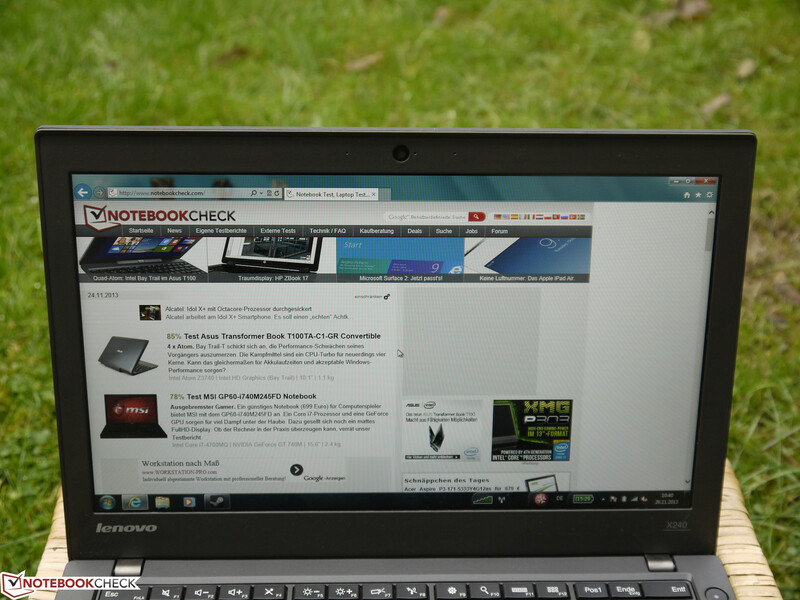 The build quality of the chassis is still quite good, coming close to the ThinkPad X230 in terms of sturdiness. Both the palm rest and the keyboard deck barely exhibit any give at all, the display hinges work flawlessly and the display almost can't be twisted. Despite of all these great aspects, most well-known weaknesses of the predecessor haven't been removed. Even slight pressure on the palm rest is enough to compress the smart card reader slot. Similarly, the areas between the display hinges both on the display frame and above the battery can easily be distorted. Although this shouldn't be too much of an issue in most real-life usage scenarios, one might rightly expect more from a premium laptop. Less is more? This seems to have been Lenovo's motto when it cut some of the ThinkPad's ports such as the ExpressCard/32 slot and the USB 2.0 port with charging capability. 2 x USB 3.0 (the right one comes with charging capability), VGA, Mini DisplayPort, Gigabit LAN, a combined Line In/Out port and a card reader remain. More ports can (only) be had during stationary usage with the help of a docking station. Unfortunately, the ones of its predecessors aren't compatible any more since the proprietary connector has been slimmed down as well. The card reader manages to reach read and writes speeds of up to 72.8 MB/s and 23.9 MB/s, respectively (using a 64 GB SDXC card made by Transcend). The positioning of the ports follows some sensible design decisions, at least on the right hand side. Here, no cable connectors should be able to block each other. Thinks look differently on the left hand side - due to the fan vents, most ports are located close to the front as well as close to each other. A flash drive, for example, might be enough to block the Smart Card reader as well as making it hard to connect a Mini DisplayPort cable unless a standard USB cable is used instead of the flash drive. More so, the cables are too close to the front, being in the way while working, almost forcing owners of a ThinkPad X240 to use a docking solution for stationary operation scenarios. In terms of communication standards, there is not much left to be desired. Intel's Wireless-AC 7260 already supports the fast 802.11ac standard, making it well-equipped for fast wireless networks. With its two antennas, it is capable of using both the 2.4 GHz and the 5 GHz band, reaching up to 867 Mbit/s. The device lives up to these expectations during real-life usage, yielding good connection speeds without any major issues or even breakups. For short distances, Bluetooth 4.0 is still on board - quite useful when one is trying to connect smartphones, keyboards or mice. Our ThinkPad X240 also comes with a M.2 standard HSPA+ module (including GPS) made by Ericsson. Although we didn't test this, it should be possible to insert a solid state drive instead. According to Lenovo's claims, the 720p webcam is supposedly quite good under low-lighting conditions, but we can't confirm this statement: It should be enough for well-lit video conferences, but no more. The ThinkPad X240 comes with a Trusted Platform Module 1.2, a Smart Card reader, a fingerprint reader and the usual password options, yielding a good basic array of security options when it comes to preventing data theft. In addition, Intel's AMT (long-distance maintenance, repairs and surveillance for security purposes) or AT (anti-theft) technologies can be used, further improving upon the range of security utilities. 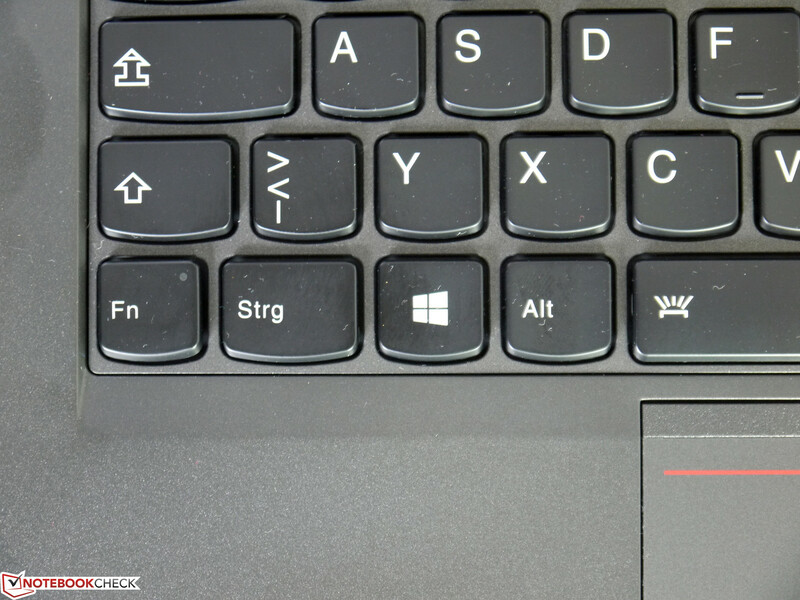 Lenovo's "Airbag" is an optional active HDD safety feature, preventing HDDs from taking damage from impacts (of course, this isn't necessary for SSDs), as is the Kensington lock connector for which a lock can be purchased separately. As usual, a lot of optional accessories can be purchased at Lenovo's store, ranging from larger batteries with 48 Wh or 72 Wh to new docking stations. While the latter - the "Thinkpad Pro Dock" (30A10065EU) which may very well be a must for stationary usage scenarios, due to the low amount of ports - is rather expensive, costing 150 euros, the largest battery - the 72 Wh one (0C52862, 68+) - can be had for as little as 70 euros. The hard drive bay isn't accessible any more, requiring removal of the entire bottom panel. After the loosening of 8 screws and leveraging of the panel, it can be lifted up. 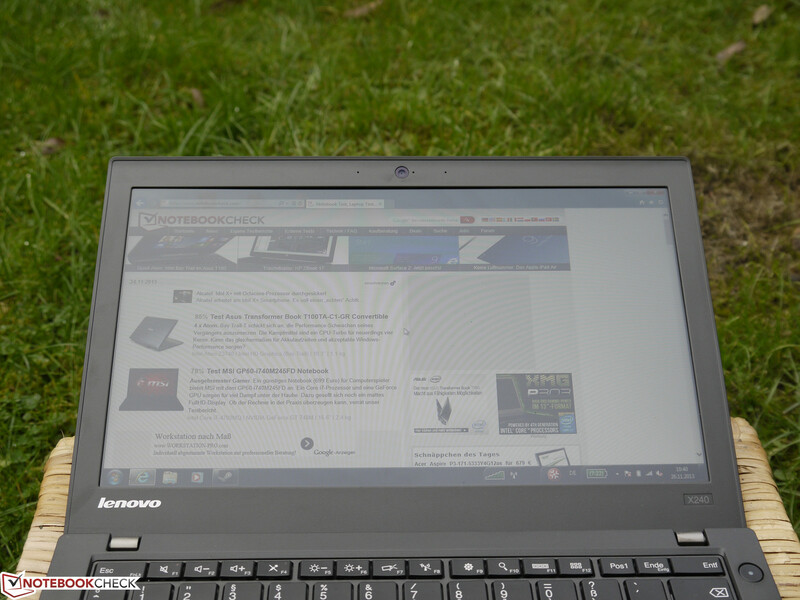 A guide (including information which steps the user is allowed to take) can be found in Lenovo's Hardware Maintenance Manual, as is almost always the case with Lenovo. A number of slots (Wi-Fi, M.2), the drive bay, the fan system and one memory bank can be found below this maintenance hatch. Unfortunately, this is indeed the only RAM slot on board, being occupied by one 8 GB module - neither soldered-on RAM nor a second bank are available. 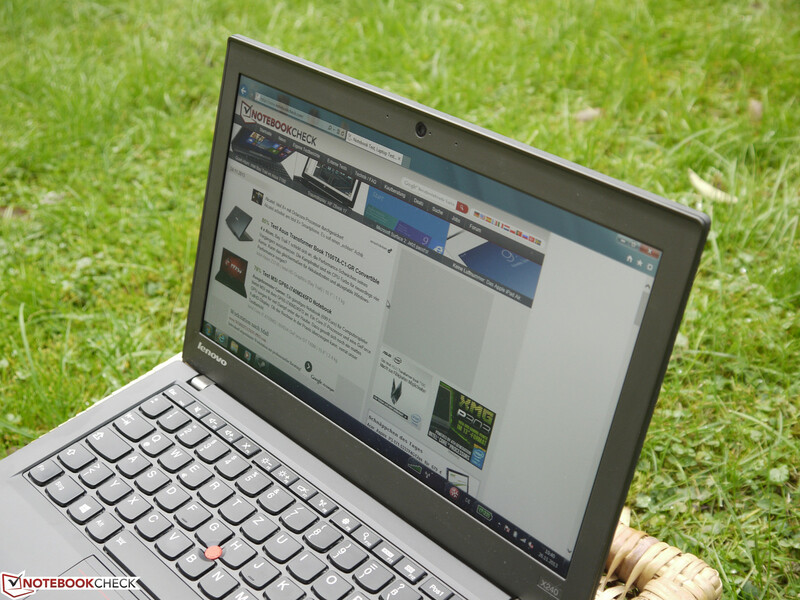 As usual, Lenovo offers 36 months of warranty for the ThinkPad X240. Warranty extensions - both in terms of quality and quantity - shall become available shortly. 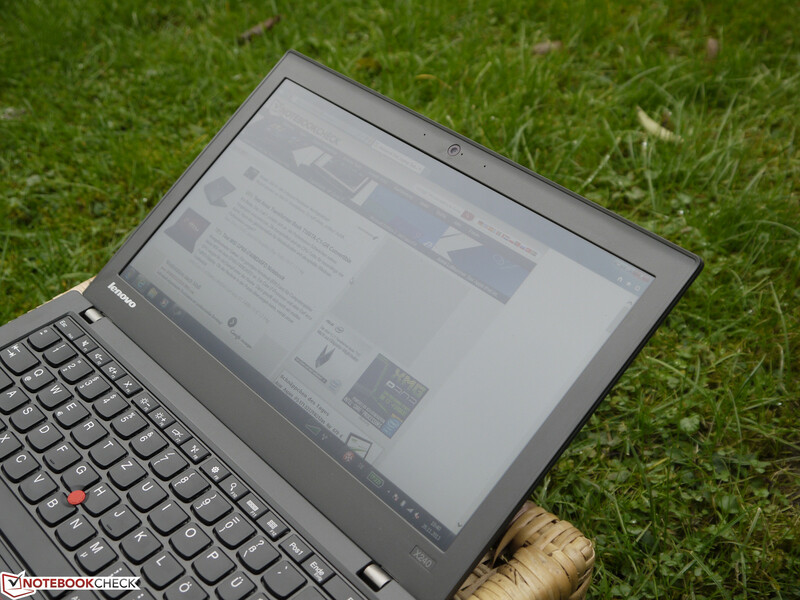 At the time of this writing, no such extensions could be found online for the ThinkPad X240. Already the ThinkPad X230 shipped with the new, well-made chiclet design. 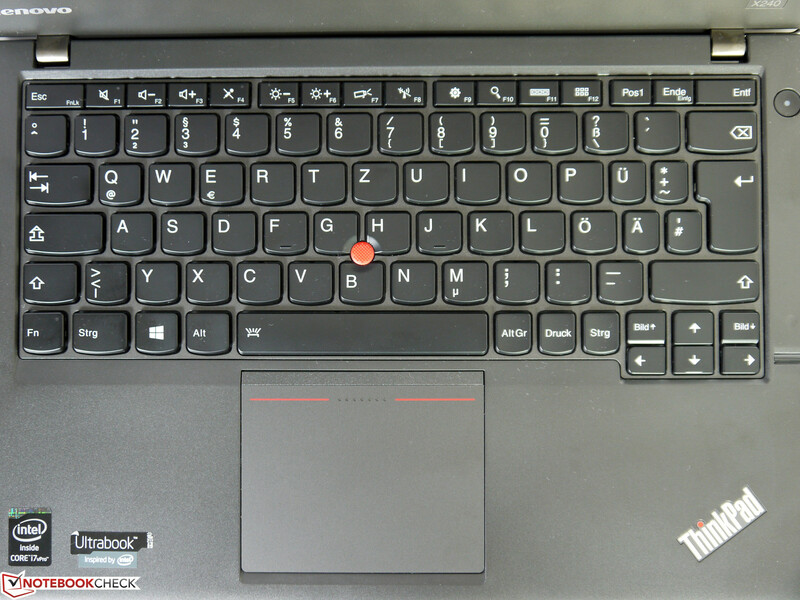 The X240 uses basically the same keyboard. We were quite impressed by its performance: The keyboard dock doesn't wobble, the keys offer medium travel, come with a great pressure point and remain rather silent. Prolific writers should easily become accustomed to this keyboard, having no problems typing even long texts. 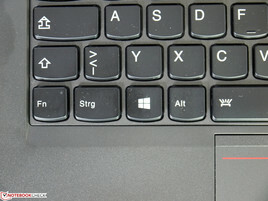 Those who aren't used to ThinkPads will take a bit more time due to the slightly unusual keyboard layout, especially concerning "Fn", "Ctrl" and "Print". 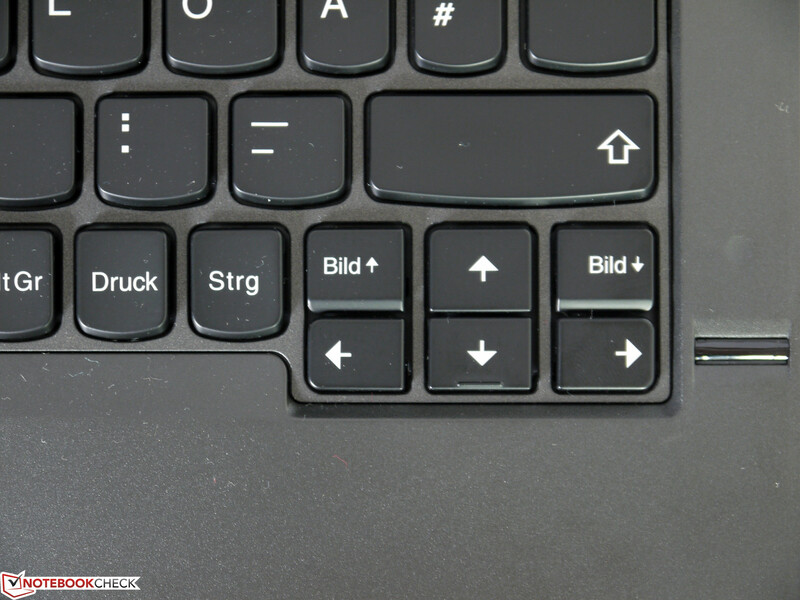 The audio controls buttons (which used to be placed in an extra row for the ThinkPad X230) are now implemented into the regular keyboard layout. The ThinkLight keyboard illumination system has been removed (as was to be expected), leaving just the keyboard backlighting system with the same old two brightness levels. 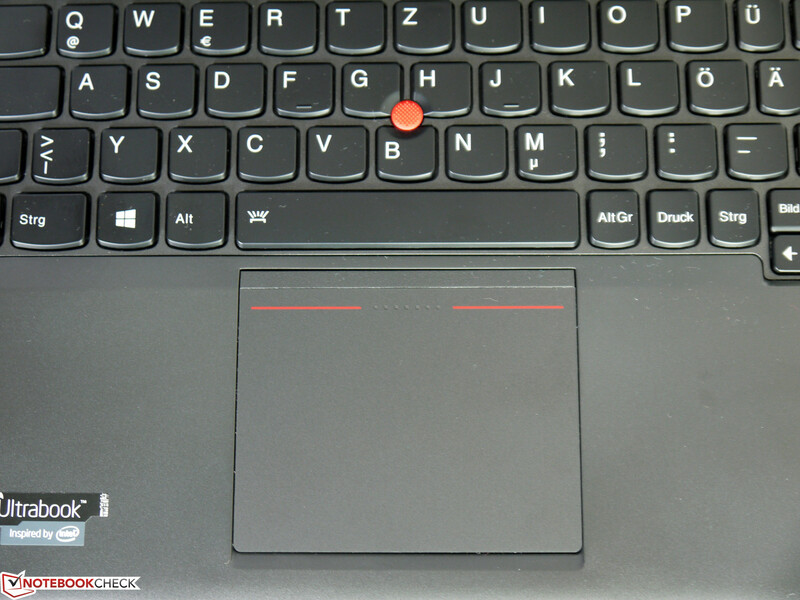 While the ThinkPad X220 / X230 did commence the move towards a 5-button clickpad with integrated touchpad and trackpoint buttons, this development is now complete. 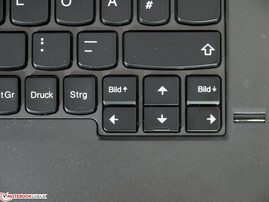 No separate keys remain: The touchpad buttons are located at the lower end of the touchpad while the trackpoint buttons are integrated into the top. 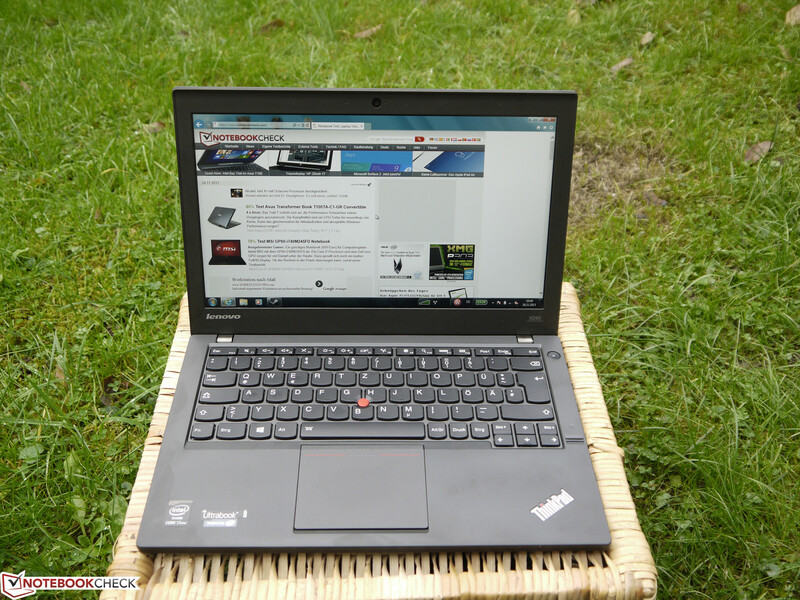 As had already been the case with the ThinkPad S series and the T440s, the new version is not quite there (yet), especially in terms of its somewhat less than perfect feedback and reliability. It took quite some time to get accustomed to the new version and even then did we still miss the separate buttons due to their high comfort. Still, gliding over the surface feels great, multitouch gestures work well, as do clicks on the pad measuring 87 x 73 mm. Up to four fingers can be recognized at the same time. Additionally, Synaptic's driver software is quite powerful, allowing for almost all functions to be activated or deactivated independently from each other. 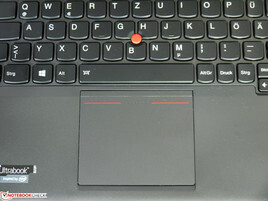 According to its spec sheet, even the most expensive variants of the Lenovo ThinkPad X240 come only with an HD display (1366 x 768 pixels), with a TN panel being used in the cheaper entry-level models (according to Lenovo's online configurator, this panel costs approximately 60 euros less) which is likely to be more or less the same as the one used in the ThinkPad X230i. Much better viewing angles, a higher contrast ratio and more vivid colors can only be had with the IPS panel - like the one which has been used in our test device. It is on par with that of its predecessors, offering similarly good characteristics. 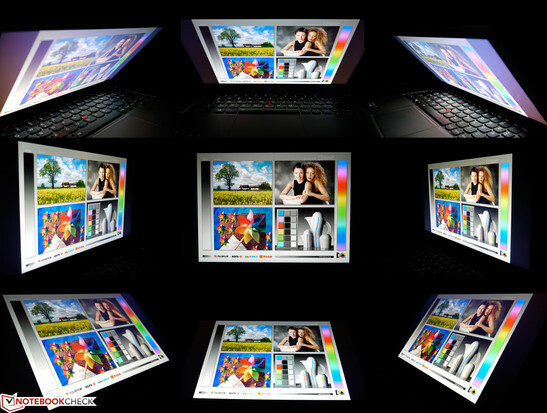 A third, touch-sensitive variant of the display of the ThinkPad X240 will most likely be available, too. In our 9 measurement areas, we have measured a peak brightness of 327 to 361 cd/m², yielding an average maximum brightness of 339 cd/m² and a brightness homogeneity level of 91 %. When set to minimum brightness, the display yields just 4 cd/m². The adjustment can be done in precise steps up to step 12 (128 cd/m²). The following three brightness steps cover the rest of the range, with step 13 already yielding 178 cd/m² (the value which we chose to use for our Wi-Fi battery life tests) and step 15 climbing all the way to peak brightness. We'd have liked to see more steps in the vicinity of 150 cd/m² which is an important range especially when the laptop is used indoors. When talking about outdoor usage scenarios, the matte display surface (preventing reflections), the high peak brightness (which remains the same when running on battery!) and the decent contrast ratio of 712:1 are a large plus. The screen contents remain easily viewable even from an angle, making it possible to work comfortably in the garden or on the terrace. Only direct sunlight might not be perfect as this requires an even stronger backlighting system. 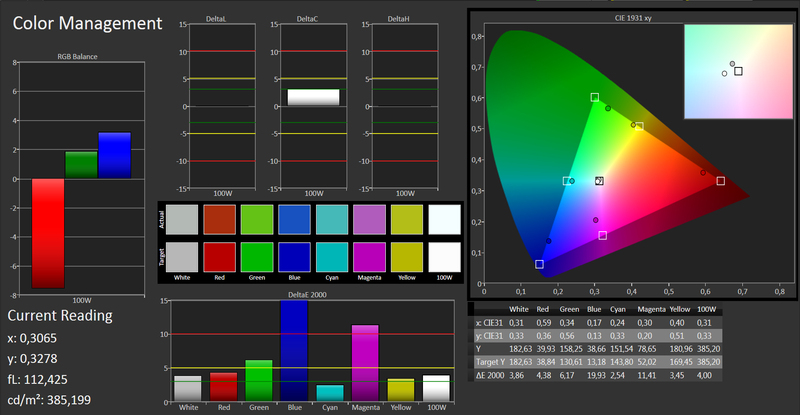 Unfortunately, the IPS panel of the Lenovo ThinkPad X240 doesn't offer great color space coverage, the same as its predecessors. 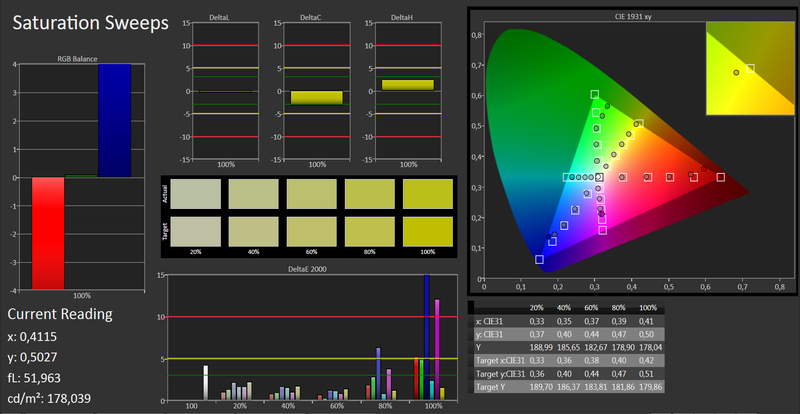 65 % of sRGB and 41 % of AdobeRGB isn't much. Additionally, the greyscale rendition the colors and the saturation values are off in its delivery condition, especially when looking at reds, blues, magentas, the RGB balance and the gamma curve. 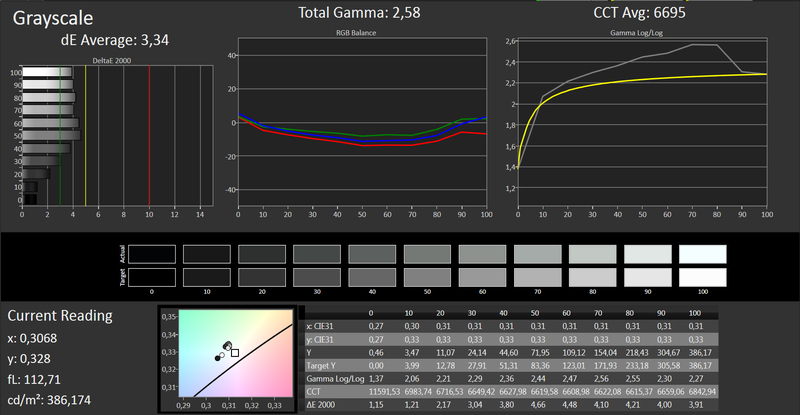 Even after calibration with our colorimeter, only some aspects are improved (especially the mixed colors) - blue and magenta retain DeltaE 2000 values of more than 10, making the display rather unsuitable for any tasks where color fidelity is paramount. Viewing angle stability is one of the strengths of the IPS panel of the ThinkPad X240, retaining the look of most screen contents even when viewing them from an angle. 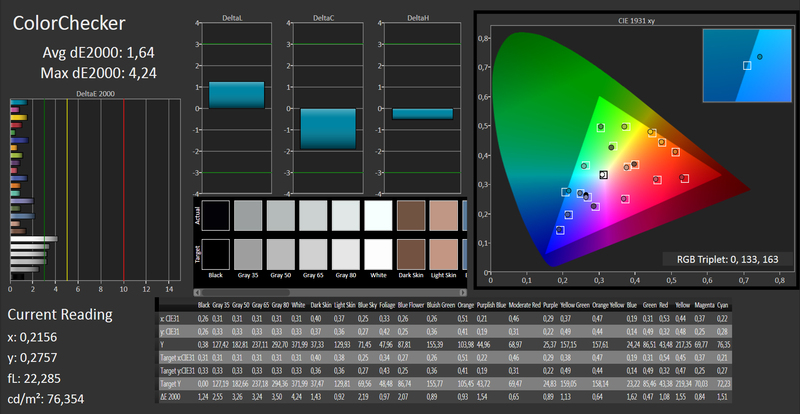 Noticeable color and brightness changes due to some minor reflections do only occur when viewing the display from the upper left corner. This, however, shouldn't be too much of an issue during real-life usage. The new slim chassis goes hand in hand with a change in APUs, from conventional chipsets to Ultra Low Voltage variants with a very low Thermal Design Power (TPD) of just 15 watts for all components together, including the CPU, the GPU and the memory controller. Naturally, this yields a ton of advantages in terms of cooling system design, power consumption and the resulting battery life. This new component alone defines the direction the ThinkPad X240 takes, away from maximum performance to a balance between performance, mobility and battery life. Another change has occured with the RAM where only one bank remains, limiting memory expandability as well as system and even graphics performance. On the other hand, most variants will offer a significant increase in performance as only the affordable entry-level models still ship with conventional HDDs. Even a second SSD could be added via the M.2 connector. The ThinkPad X240 is currently available with three different processors, ranging from an affordable entry-level variant with an Intel Core i3-4010U (clocked at 1.7 GHz, but lacking Turbo Boost mode) and an in-between choice with an Intel Core i5-4200U CPU (clocked at 1.6 to 2.6 GHz, allowing for significantly improved performance levels) to the most powerful state-of-the-art model with an Intel Core i7-4600U CPU (clocked at an even faster 2.2 to 3.3 GHz while coming with 4 MB of L3 cache). 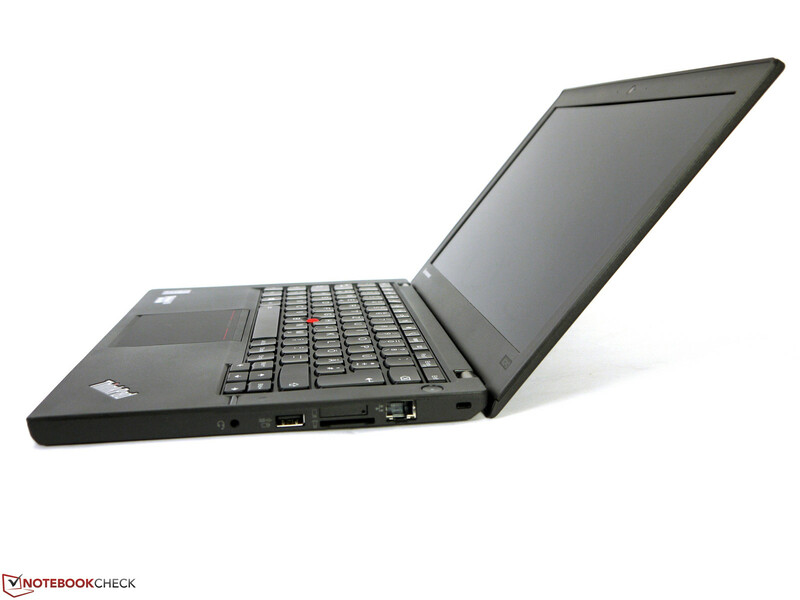 The latter has been used in our test device, being the fastest CPU currently available for the ThinkPad X240. The benchmark results are pretty much what we would have expected, coming to lie a bit above those of an Intel Core i7-4500U CPU (which offers 300 MHz less). 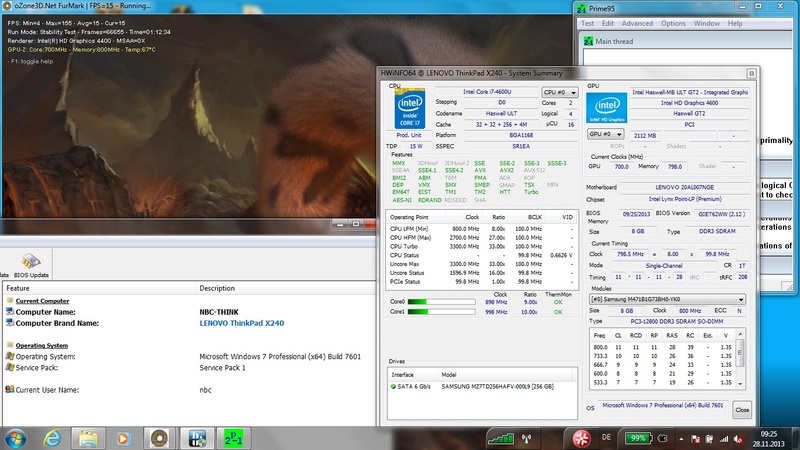 Our test device managed to yield 4665 points (single) and 8259 points (multi) in Cinebench R10 32 bit respectively. 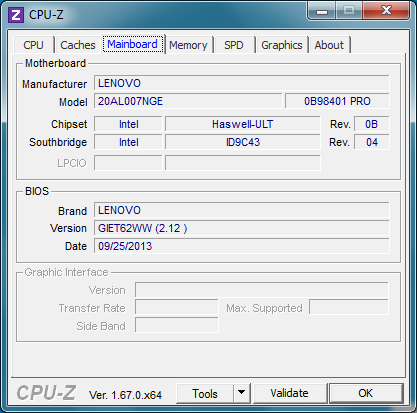 The CPU never reached its maximum clock speed of 3300 MHz (except when idle), despite TurboBoost+ being activated in Lenovo's energy manager. Even during the SuperPi calculation (32M, 624s), just up to 3000 MHz were measured, with the CPU apparently not making full use of its Turbo mode potential. 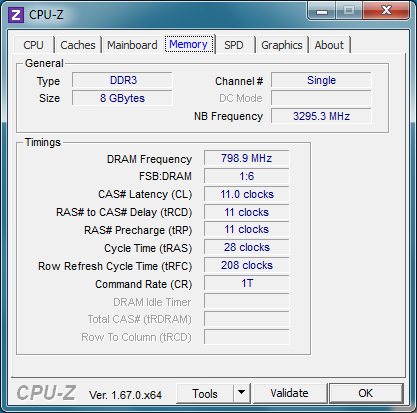 During the wPrime 1024m calculation (multithreading, 614s), the clock speed decreased from 3000 MHz to 2500 MHz after just a few seconds. Even during our life-like tests, the CPU appears to have a hard time. During the CPU video conversion test with Cyberlink's MediaEspresso (multithreading), our test device even fared worse than the Dell Latitude E7240 with its nominally weaker Intel Core i5-4200 CPU. Then again, during an audio conversion test with iTunes (singlethreading), the world looks like a brighter place for the ThinkPad X240, allowing it to take the lead when compared to its ULV competitors, reaching 48.7 times the base speed. 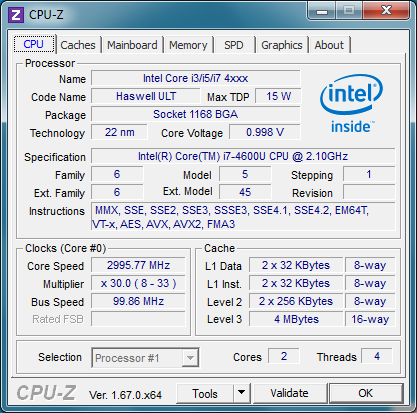 Under full load of the CPU as well as the GPU at the same time, the CPU clock speed even gets decreased to 1 GHz permanently, with the GPU coming in a t 700-750 MHz. 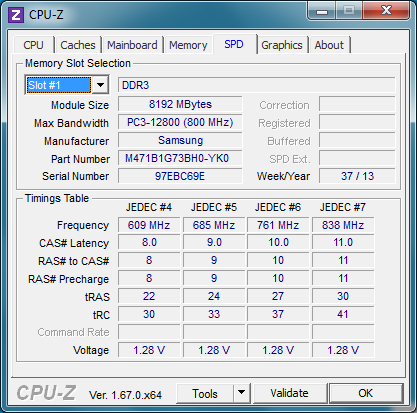 This is likely due to the TDP of 15 watts which decreases the power consumption levels of the CPU by quite a lot in order to keep true to this specification. 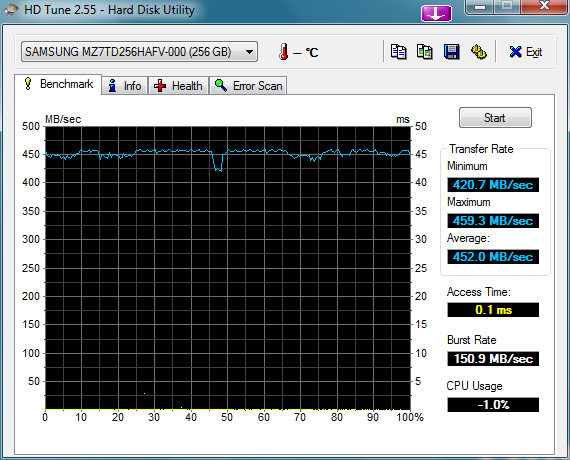 Indeed, after a short time, the laptop "only" draws around 25 watts (starting at 35 watts), and reproducibly so. When only Prime 95 is active, taxing just the CPU, the CPU clock speed climbs to 1.2 GHz with the GPU clock speed being measured as 850 MHz. Once again, power consumption levels hover around almost 25 watts. No further reduction in terms of performance occurs when running on battery. We have been able to measure basically identical results here. Overall system performance is rather good, but again it suffers from CPU and GPU throttling when the device is put under full load. This may not be relevant for Office, web browsing, image editing or video playback tasks, but it does become more important when trying to convert audio or video files, yielding lessened performance levels when compared to conventional CPUs. Another choke point can be found when looking at the RAM. It's not even that a maximum amount of 8 GB cannot be exceeded, but rather that only one slot is available, forcing the RAM to be used in single channel mode. This does not only decrease the performance of the RAM itself, but also the graphics performance, as it depends on the memory bandwidth as well. Dual channel mode might actually increase effective GPU speeds by around 20 %. Still, thanks to its fast mass storage, the PC Mark benchmark results are quite good, yielding 13472 points during PC Mark Vantage and 4388 points during PC Mark 7. There is absolutely no reason to complete about the Samsung-made solid state drive being used in the ThinkPad X240. It is fast, comes with low access times, leads to snappy (subjective) performance when opening files or apps and offers a rather generous amount of 256 GB of (gross) storage space. It could even be augmented by a second SSD since the WWAN module could be swapped for an additional (M.2) SSD. The same holds true for both the CPU and the integrated GPU, an Intel HD Graphics 4400: Together, they must always observe the TDP limit of 15 watts. As already mentioned, another bottleneck is the RAM module with its single channel mode as the GPU depends directly on the RAM (Shared Memory), reducing its peak potential by approximately 20 %. In a direct comparison, it is still marginally better than its predecessor model, the Intel HD Graphics 4000, yielding 3286 points during 3D Mark Vantage (instead of 3198) and 799 points in 3D Mark 11 (instead of 627). The graphics performance should be enough for most tasks - with 3D graphics and games marking the only major constraints. Intel's Quick Sync Video is far better suited for video conversion tasks, putting less strain on the system while finishing conversions up to 10 times faster than CPU-based programs (depending on the format used). More about this can be found in our CPU section. 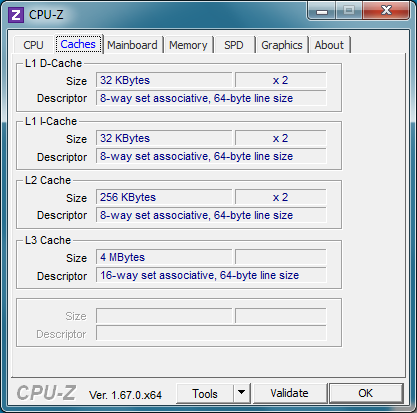 Under simultaneous full load of both the CPU and the GPU, the graphics clock speed is reduced to 700 MHz (850 MHz if the CPU is not stressed). 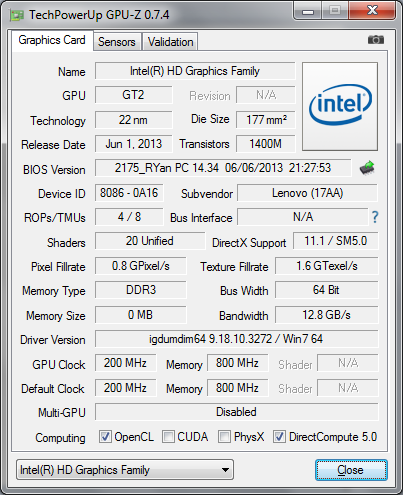 The maximum measured clock speed - reached during short moments under full load - was 1000 MHz, still a bit less than the maximum clock speed of 1100 MHz which is only observed when the laptop is idle. 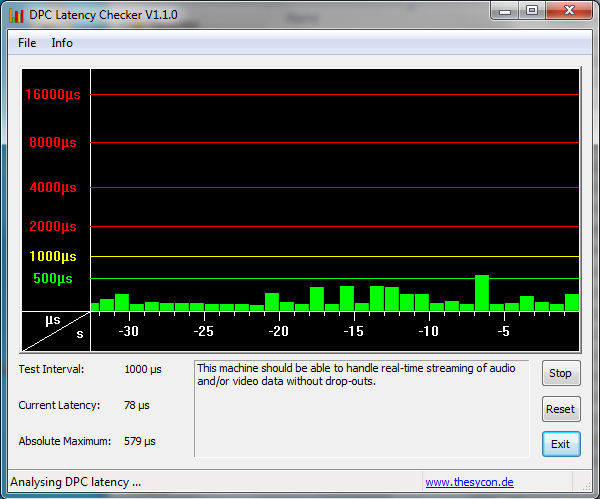 No further throttling occurs when the laptop is running on battery, yielding basically identical test results.